A teachers strike in West Virginia will head into a second day. The leaders of three unions representing teachers and school service personnel made the announcement Tuesday night that the walkout will continue Wednesday. The Republican-led House voted earlier to indefinitely table a complex education bill that the unions oppose. Without being specific, West Virginia Education Association President Dale Lee says the unions believe there’s still a small chance there could be further developments with the legislation. 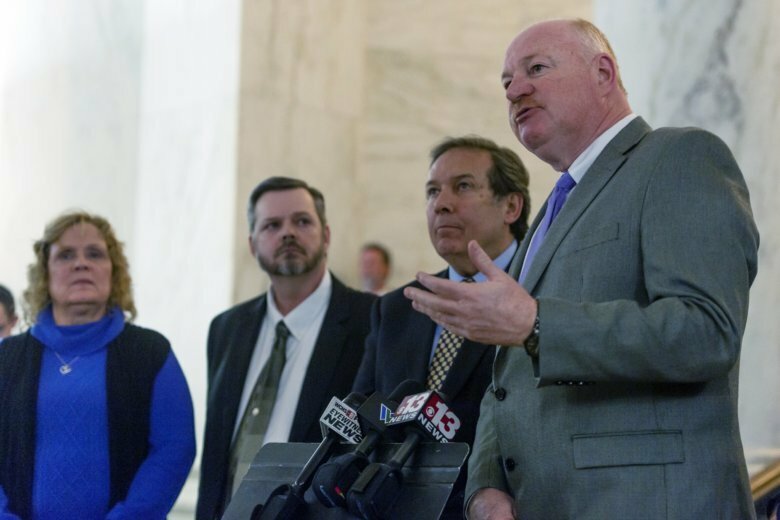 American Federation of Teachers’ West Virginia chapter President Fred Albert says that although the unions’ trust in the House has been somewhat restored, there is no trust in the Senate leadership, which has tried to rush the bill to passage. This item corrects attribution of the quote to Fred Albert, not Joe White. Union leaders for teachers are celebrating a move by the West Virginia House of Delegates to effectively kill a complex education bill that prompted a strike. Three unions representing teachers and school service workers say they’ll meet with union members before deciding on further action, which could include ending a strike that began Tuesday. The unions have scheduled a late afternoon news conference. The Republican-led House voted 53-45 Tuesday to approve a motion to table the bill indefinitely. It means the bill won’t go to the next step: a committee of Senate and House members who would try to come up with a compromise. Teachers’ unions disliked components of the bill that would have created the state’s first charter schools and allow education savings accounts for parents to pay for private school. The West Virginia House of Delegates has effectively killed a complex education bill disliked by striking teachers’ unions. Cheers erupted from the House galleries where hundreds of teachers were in attendance. It wasn’t immediately known whether the vote would end the strike, but teachers started leaving the Capitol afterward. The vote came after the House rejected a motion to postponed debate for several hours to allow delegates to read up on the complex bill. Teachers’ unions went on strike Tuesday. They disliked components of the bill that would have created the state’s first charter schools and allow education savings accounts for parents to pay for private school. West Virginia public school teachers and school service workers are hitting the picket line and packing the state Capitol on the first day of a statewide strike. The only county where public school classes are being held Tuesday is in Putnam County, where school parking lots were nearly empty. A few cars trickled in to drop students off but no buses were seen. Teachers and supporters from other counties joined Putnam County teachers on the picket line as motorists honked their support. Teachers’ unions oppose complex legislation under consideration that would create the state’s first charter schools and allow education savings accounts for parents to pay for private school. West Virginia teachers have embarked on their second strike in a year, but one of the 55 county public schools districts is staying open. Putnam County schools says in a statement its schools are open Tuesday. Several Putnam County parents responded on Facebook that they wouldn’t send their children to school across teacher picket lines. Nearly all of West Virginia’s 55 counties have called off public school classes Tuesday as teachers protest education legislation that their unions view as lacking their input and as retaliation for last year’s nine-day strike. Almost a year to the day after West Virginia teachers went on strike that launched a national movement, they’re doing it again. Nearly all of West Virginia’s 55 counties have called off public school classes Tuesday as teachers protest education legislation that their unions view as lacking their input and as retaliation for last year’s nine-day strike. That walkout launched the national movement that included strikes in Kentucky, Oklahoma, Arizona, Washington state, and more recently, Los Angeles and Denver. Now the movement has come full circle. Leaders of three unions for teachers and school service workers say how long this one goes on will be a day-to-day decision. An amended bill that the Senate passed Monday now goes back to the House of Delegates. Among other things, it would create the state’s first charter schools.